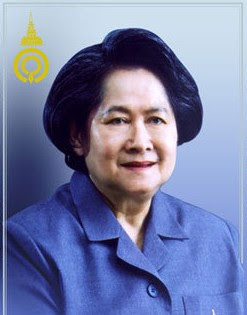 Last Friday (14 Nov 2008) was the beginning of the 5 days long Royal Cremation Ceremony for Her Royal Highness the late Princess Galyani Vadhana (the elder sister of his Majesty King Bhumipol) of Thailand. In conjunction with the royal cremation, people of Thailand were told to wear black or white for 3 days as the mourning period for the late princess. 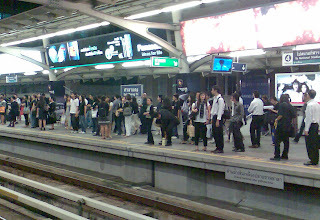 Even though I am a foreigner living in Bangkok, I also wore black shirt with grey pants to show my respect. I was glad that I did because as soon as I was on the street, I saw that almost 99.9% of the people wore black or white as told. It was amazing to me that Thai people really respect the royal family. Growing up in Malaysia, I never pay much attention to the royal family in my own country. But here in Thailand, the royal family is part of Thai life. You can walk in the streets of Bangkok without seeing photos of their Majesties the King and Queen. In light of the late princess’ royal cremation ceremony, I can see that Thai people are very united. Although monarchy has become history in many countries today, it is good to still have a royal family in a country. Though the royal family may not have the power they possessed before, but it sort of unites the people in the period of political separation in Thailand. I cannot imagine any country in the world where almost all the people (including foreigners like myself) would wear black to bid farewell to a princess. To me, this is one of the precious experiences I have in Thailand. 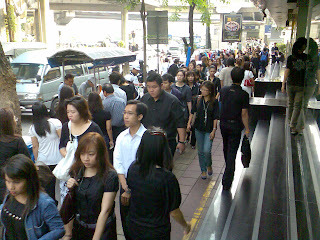 By the way, when Bangkokian wear black, there are still fashionable. I saw black and white poker dots skirt, black lace skirt, or simply black dress with cool silver necklace, etc. From my observation, Bangkokian sure mourned in a fabulous way.